TouchArcade has spotted the appearance of a free MAME game emulator on the App Store called iMAME. MAME is a popular arcade machine emulator that will run thousands of arcade games if you have the original ROMs. 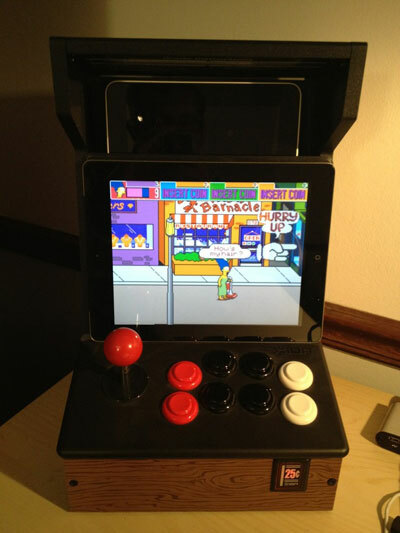 iMAME running Simpsons with iCade support. Apple has had a bit of a spotty history with emulators on the App Store. While a number of individual emulators do exist on the App Store, Apple has been more restrictive about these open emulators, presumably due to potential legal issues. For example, a full DOS/Windows 3.0 emulator appeared in the App Store at one point but was quickly pulled by Apple. Update: It took Apple two days to get around to it with the holidays, but iMAME has been removed from the App Store. Don't think I'll ever use this, but downloaded it just in case. I can put in a folder with Tether titled "Banned 2011 Apps"
Easiest way is to open "www.macrumors.com" in your iPod Touch's web browser, then click on the "Link" at the end of the article. Download it now while you can! It's not breaking any of the app store rules. There are many emulators up on the app store. The only app store requirement is that you can only play games bundled with your app. It doesn't cover users jail breaking the phone and loading more. How do I download it? iMame emu isn't in the app store? No, I just finished downloading a copy (after seeing this comment). 1. WiiMote's don't work. They require chip level access to the Bluetooth chipset which will only work on jailbroken devices. 2. You need the ROMs for iMame4All for the GP32X (MAME v37b5). If you can find them they should work. 3. When I created the iMame4All Xcode project I included all of the sound samples for the iMame4All ROM set. I did not submit this to the App Store, that was done by Jim Van who used my iMame4All Xcode project as a base starting point then trimmed out anything that was not App Store compliant. For controllers there are 2 options - iCade and iControlPad. Let me explain the difference between them. When you connect your iControlPad or iCade a window will pop up asking which mode you want to use. I highly recommend choosing iCade mode for both controllers (put the iControlPad in iCade emulation mode). The reason is that in iControlPad mode it expects the controller to be in special packet mode. This will allow you to use the dual nubs on the iControlPad to play games like Robotron, however the downside is that there is a lot of data being transmitted over the Bluetooth and iPad 1's and anything less will have a hard time keeping up. Hope this clears some stuff up.